Repetition warning: This post repeats bits, and riffs on others, that you might have already seen in the Guide to agile communication that I did while I was at Defra, and in some of my other posts here. Sorry. 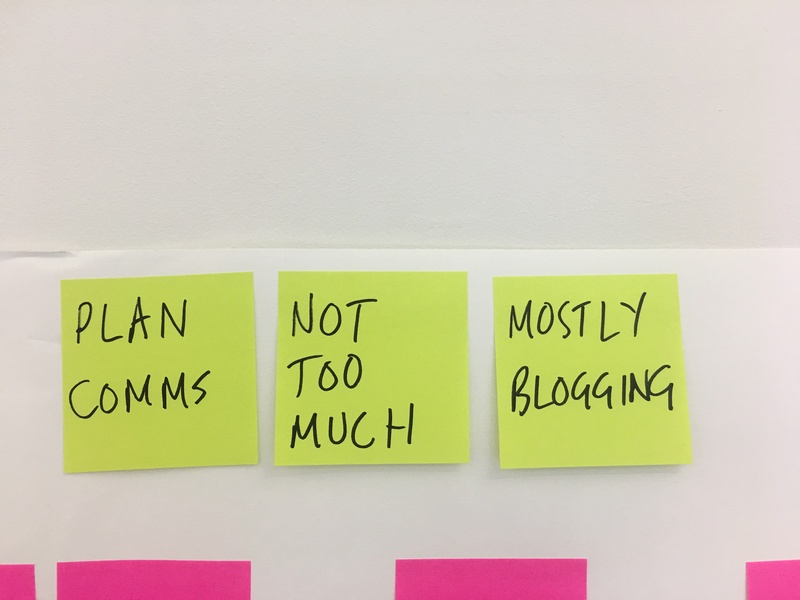 Some teams, particularly government teams, love to plan their future communication out on what’s usually called a grid, and is usually in reality a spreadsheet. The grid is an attempt to predict and dictate exactly what will be communicated when. As I understand the concept, grids originated among press teams that deal directly, and daily, with journalists. For them, I’m sure that grids are an excellent idea. Grids help the team’s leaders plan ahead. On this date, we shall tell the world about x. On that date, we shall send out a press release about y. But most government teams aren’t trying to deal directly with journalists. Their comms are not aimed at journalists. If journalists happen to see anything they put out, that’s a by-product, not a goal. Most government teams are trying to communicate with their peers in other departments, and with people who they might want to hire in future. They’re mostly already civil servants, or considering the idea of becoming civil servants. They don’t have newspapers to fill. They just want to know what’s going on. So most government teams don’t need a grid. They just need a rough idea of what they might be saying. That rough idea should come not from the leadership team’s ambitions, but should be dictated by the actual work. If the team has done some roadmapping, that’s a good place to start. The roadmap will give you an idea - just a rough one, but an usable one nonetheless - of where things are likely to be in 3 months from now, and in 6 months, perhaps a year. You can be pretty confident that in 3 months you’ll have something to say, but you shouldn’t try to predict what it will be yet. Whatever the team discovers or builds will dictate that. Your communication, when it happens, should be as agile as the work is. Everyone is already too busy, most of the time. If you keep your communication short, you’re doing your audience a favour. So don’t put out too much stuff, and don’t make the stuff you put out too long. Consider how much time and attention span you’re prepared to grant to any organisation apart from the one that employs you. That’s roughly how much time you can expect other people to grant you in return. Be brief, be informative, and make your stuff more readable by making it more relatable. Use the human voice; communicate your organisation’s thoughts as if they’re human thoughts. As m’colleague Ben tweeted just this morning, blogging is “a good way to share knowledge in the open”. That’s what you’re aiming for. That’s what those peers and potential hires are keen to see from you. Blog posts are unfashionable but they’re open, they’re entirely under your control, and if you look after them, they build up into a hyperlinked narrative across time. Your blog is not the only tool you have, but it’s the one that should sit at the centre of your communication. Use other tools, yes, but make them link back to posts on the blog. The blog is the heart of it all, the long-term archive you can nurture and curate and care for. Plan comms. Not too much. Mostly blogging.